Creative IT, the leading independent data recovery company, provides external hard drive repair services in London. Our services are done in house by a team of dedicated technicians who have years of experience in opening external drives and carrying out repairs down to component levels. We have a London based data recovery lab located in Bermondsey, off Tower Bridge road, in London SE1. We perform data recovery services from physically failing external hard disks of all makes, models and capacity. Most external hard drives are silent when they function properly. 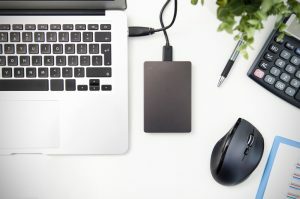 If you start noticing that your external hard drive is physically damaged and making unusual sounds including clicking, grinding, bipping or squealing noises, it’s time you find a specialised data recovery company that can ensure your data is safe and accessible even if your drive is dying. We can troubleshoot the issue with your external hard drive on the same day and present you with a precise diagnostic on the hard drive fault and a solution to get your data retrieved. We offer our external data recovery services to drives that are physically damaged or affected by problems with internal components such as the PCB board or when the USB connector is broken. In some cases, an identical external hard drive is required when there are issues with the PCB board. When swapping the PCB board from the healthy external hard drive onto the broken one, our technicians also swap the original ROM chip and solder it on the new PCB board. A donor drive is also required when the heads are damaged and need to be replaced. If you experience unusual sounds or strange behaviour with your external hard drive, get in touch with Creative IT. We are an ISO 27001 certified data recovery company and will help you retrieve your data if you are no longer able to access it. We work on all makes and models of external hard drives with physical faults including Samsung, Hitachi, G Technology, Western Digital, Synology, LaCie, Toshiba and many more. Our data recovery centre has a walk-in service Monday to Saturday from 09.00 until 18.00.